Ireland is rife with spectacular coastal terrain and rich history, not to mention world-class links golf courses. To the north, Royal County Down and Royal Portrush reign, with less-ballyhooed links like Castlerock and Ardglass rife for discovery. Ballyliffin and Enniscrone are off-the-beaten-path gems in the northwest. In the south, it doesn't get much better than Lahinch Golf Club and its Old Course's amazing No. 6. Your eyes will be stimulated off the course as well, with castle ruins and natural wonders dotting the landscape. GolfEurope.com's Brandon Tucker offers up some of his best shots on the course and off from his recent trip to play golf in Ireland and Northern Ireland. Ardglass Golf Club in County Down is a hidden gem of Northern Ireland links golf. Ballyheigue Castle Golf Club's ninth plays up to the base of the old castle ruins. Ominous Glashedy Rock looms offshore of Ballyliffin, Ireland's northernmost golf club. The Giant's Causeway in Northern Ireland is one of the island's most spectacular natural wonders. The par-3 fourth at Castlerock Golf Club in Northern Ireland is known as "Leg o' Mutton." Connemara Golf Club in northwest Ireland features uniquely rocky links terrain. Royal County Down in Northern Ireland is one of the most spectacular stages for links golf in the Isles. Enniscrone Golf Club in northwest Ireland: A fantastic bargain playing through dramatic dunes. This stone building near Castlerock is one of many spectacular sights along the Causeway Coastal Route in Northern Ireland. No. 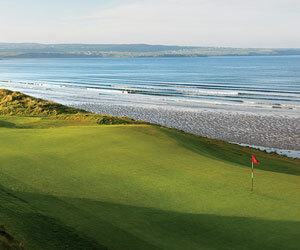 6 at Lahinch Golf Club's Old Course is a fantastic par 4 that plays out to the coast. Parkland golf course Lisselan sets itself apart from the pack by offering funicular rides between some holes. Portmarnock Golf Club near Dublin is a classic century-old links. Royal Portrush is Ireland's only British Open venue. Ever-changing weather makes rainbows like this one over Royal County Down's Annelsley Links clubhouse a frequent sight in Ireland. Dunluce Castle is located just a mile or so from Portrush in Northern Ireland.